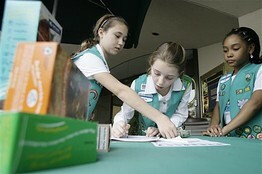 The Philanthropic Family has a fantastic piece titled What Nonprofits Can Learn from a Girl Scout Manual. "Don’t laugh, but I’m the cookie mom for my daughter’s Daisy troop" says author Sharon Schneider. "There are still boxes of Thin Mints and Samoas in the corner of my living room..." Certainly a sentiment many folks out there can currently relate to. She continues, "We have to get rid of those extra boxes, and so I read some of the material provided by the Girl Scouts about site sales. What caught my eye was an admonition for the adults not to take over the activity." After reviewing the product guide, Schneider concluded that "as the Girl Scouts manual so delicately points out, the larger goal isn’t to sell a bunch of cookies. The larger goal is to teach the girls critical leadership and entrepreneurial skills that they can apply elsewhere. And to accomplish that goal, there is no more important step than putting the girls in charge of cookie sales with adults coaching them." Definitely read the entire post here. I've certainly gained skills by watching some of our girls in action! What have you learned from The Girl Scout Cookie Program?